Our indoor plenum rated jacket assemblies are rated for all indoor installations, including plenum rated spaces. 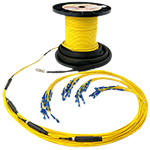 A cable rated for plenum installation will have low-smoke characteristics as defined by the NFPA (National Fire Protection Agency). 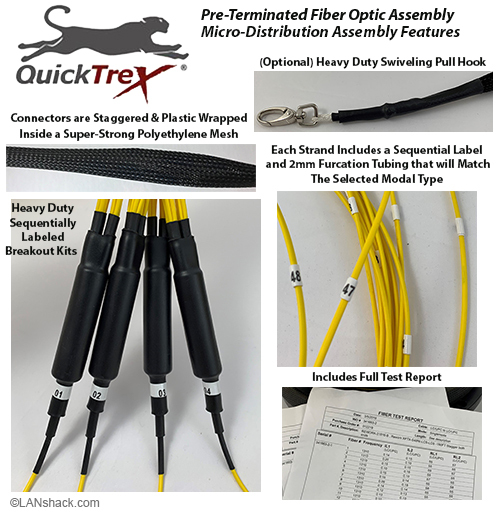 • Headend Termination to a fiber "backbone"
• All Pre-Terminated Micro-Distribution Assemblies will be custom made at the time of your order, built with Corning® fiber and premium components to your specifications. 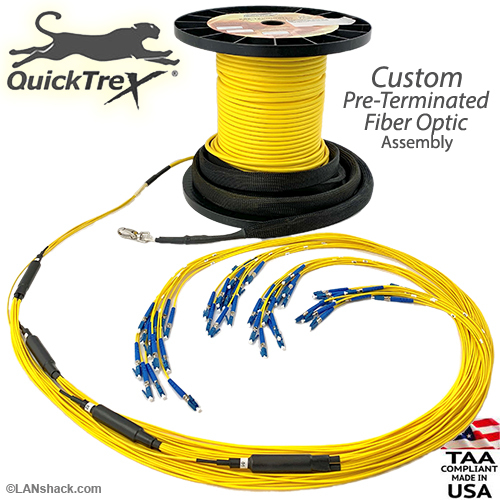 • All micro-distribution assemblies will be constructed using 12 strand grouped breakouts. Each strand will be reinforced with 2mm furcation tubing which helps ruggedize each strand and help protect it during installation. Each strand will include a sequential numerical label. Each 12 strand breakout kit will also be sequentially labeled to help identify each strand on opposite ends of your assembly. • The buffer tubes will be securely fastened to each 12 strand breakout kit using high strength adhesive type heat shrink tubing. • The first main breakout will be 12 inches from the main jacket and each group of 12 strands will include a 36" breakout. The main 12 inch breakouts kits will include a 6" stagger. • The connectors itself will also be staggered to minimize the size of the pulling basket which will be approximately 1". 1) The transition from the buffer tubes to the cable jacket. • Pulling Eyes (pulling baskets), if equipped are made from super strong polyethylene mesh and feature a free-spinning buckle to eliminate twisting of the cable during the pull.